Harbach, R.E., Rattanarithikul, R. & Harrison, B.A. 2017. Anopheles prachongae, a new species of the Gigas Complex of subgenus Anopheles (Diptera: Culicidae) in Thailand, contrasted with known forms of the complex. Zootaxa 4236(1): 65–81. doi: 10.11646/zootaxa.4236.1.3. Full article (PDF) Reference page. 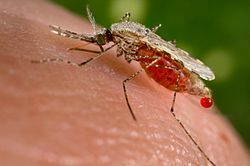 For more multimedia, look at Category:Anopheles on Wikimedia Commons. Эта страница в последний раз была отредактирована 21 марта 2019 в 19:53.